Post the trip, the friendship got stronger. Aakash and Sumit had become like family. There was no partition in room which said what belonged to whom. There was one key to the room and everyday they had a perfect sync while they left the room as well as returned back. Days passed on and it was almost a month of professional life. The other day when we had been to temple, after every incident you were looking at her. You took the prasadam and gave it her. You followed her every footstep in the temple. While having dinner, you ordered gobi paratha only after Purvi ordered gobi paratha. You text her ‘good morning’, ‘good night’ and ‘what not’ every day. Most of the times when you are having chat with her, you ignore to everything I say and nod your head. In the trip we had, you updated her every place we visited. Sometimes you even ask her what color dress she is wearing to the office. You presented her a Chinese clay model on her birthday and you have purchased similar one for yourself. You have written poems on her. And I have 51 more other such things to say. There was a long silence in the room. 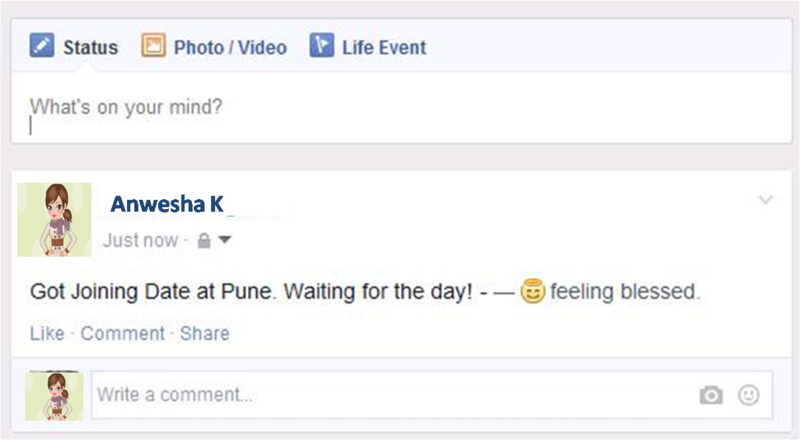 Meantime Aakash opened his facebook account to check his updates. What next purvi is engaged?? What about sumit?? U r making it quite exciting. So Sumit is in love with Purvi but he just found out she is engaged! Oh no!!!! And there is Aakash left to pick up the pieces of Sumit I bet….. It your kindness to address so!